Woller Precision Machine in Pound, Wis., makes components for the medical, defense and consumer appliance industries. It also produces small-batch quantities of aluminum interior commercial aircraft components. The company wanted to expand its production capabilities to better meet customer demands, but it was limited by its current machining equipment. It decided to replace its vertical machining centers with horizontal equipment in order to be more competitive and profitable. 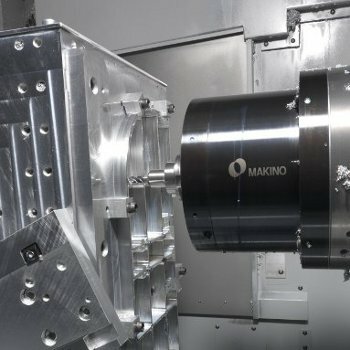 Woller Precision had already leased a Makino a61 horizontal machining center, which had led to immediate improvements in productivity and 30 to 50 percent decreases in cycle times. When that lease was up, Woller Precision decided that automated horizontal machining would make the most of its skilled labor. Because of its prior experience with Makino, it purchased a Makino Machining Complex (MMC2) automated material-handling system with 28-pallet capacity and two a61nx horizontal machining centers. The cell was controlled by a MAS-A5 cell controller. The company appreciated the scalability of this equipment to meet future growth. Additionally, Woller Precision invested in a Makino PS95 vertical machining center to perform work on pre-hardened steel in its one-off batch orders. The PS95 machine is being used for roughing and finishing operations, and Woller Precision is obtaining double the tool life in its 40 to 44 HRc materials.